We have a huge week ahead in Scott County with lots of voter mobilization events, so if you're in the area, come on out! Tonight - Monday, Oct 29th - Scott County Voter Mobilization Phone bank - 6:30pm at the Meeting House at Georgetown College. We'll call Georgetown residents to make sure they're all set to vote, along with our local NAACP allies. Tuesday, Oct 30th - Thriller Zombie event in Georgetown 7pm down town o Main Street. If we can, let's gather in front of the Lock and Key at 6:30pm and again at 7pm. 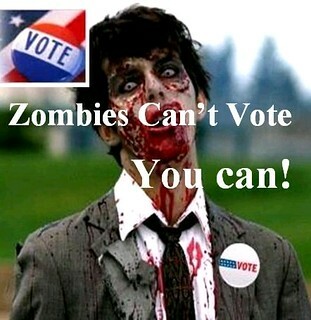 We'll pass out zombie-themed handbills encouraging people to vote. (Rain date is Oct 31st). Don't be a zombie! 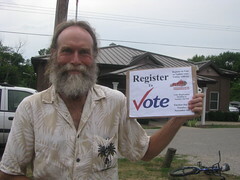 - learn about the candidates at www.KentuckyElection.org and vote on Tuesday, November 6th. With Halloween close upon us, there are a lot of big zombie-related shenanigans across the state of Kentucky in the next few days. And with the election just a couple of days after, we decided to use this opportunity to mobilize voters - and have a lot of fun doing it. We seek conscientious artists and craft folks who want to stand up for social justice in Kentucky by contributing their work for our friend- and fund-raiser: the Scott County Chapter of KFTC'S Third Annual Arty Pie Party on November 17th at 7:30 p.m.
We warmly invite you to attend and hear what we're up to. 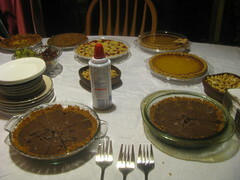 Plus we have a blast with great live gypsy music, delicious pies and spirited conversations. KFTC gives voice to thousands around the state who join together in order to improve our lives. 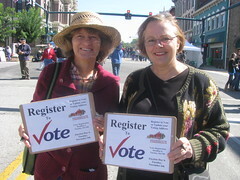 Members of the Scott County Chapter of Kentuckians For The Commonwealth were out today at the Festival of the Horse in Georgetown canvassing the crowds and registering more people just days before the Oct 9th deadline. We only registered about a dozen voters, but at least twice that many people stopped ut to ask questions about what candidates will be on the ballot, how to cast an absenttee ballot, or about some other election-related question. Others remembered our Scott County Voter Guide from the primary election and let us know that they're looking forward to receiving one for the General Election. 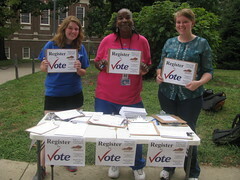 Big Weekend Push to the Oct 9th Voter Registration Deadline! The voter registration deadline is just a few days away on Tuesday, October 9th. An array of events over three days as part of Northern Kentucky Loves Democracy A table at this weekend’s Swappin’ Meetin’ in Harlan County The Festival of the Horse in Scott County A 36 hour straight voter registration marathon in Lexington! And a 48-hour-straight voter registration marathon in Louisville!! And much more! Contact your local KFTC Organizer to see if there are voter registration events in your area this weekend, and come on out and join us! Or if you can’t do that, at least make sure you and your friends and family are all set to vote.